Notice that we said that the Ozark Riverways weren't interrupted by the dams and systems of today. However, back in the early 20th century, communities found ingenious ways to harness the power of the water and springs without radically transforming the landscape. For a perfect example, you don't need to go any further than Alley Spring, home to the Alley Mill. Built in 1894, the mill ingeniously used submerged turbines (instead of a water wheel) to power the grinding of grain. The result helped to turn the area into a community center and later a tourist destination. Today, the Alley Mill is a symbol of a simpler past, where the beauty of nature and human progress (for the most part) peacefully coexisted. Natural Wonders, Immortalized by Three Different Mints! 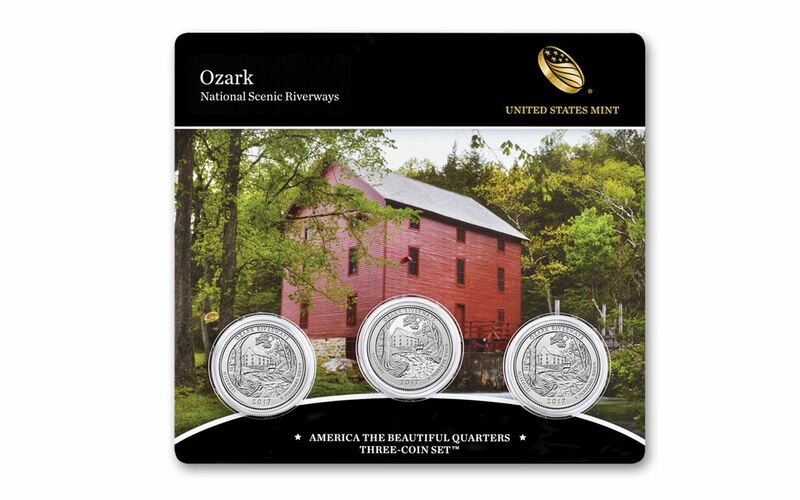 With an amazing amount of National Park Service sites in Missouri, you could see how difficult it could be to choose just one for the popular America the Beautiful Quarters® Program. 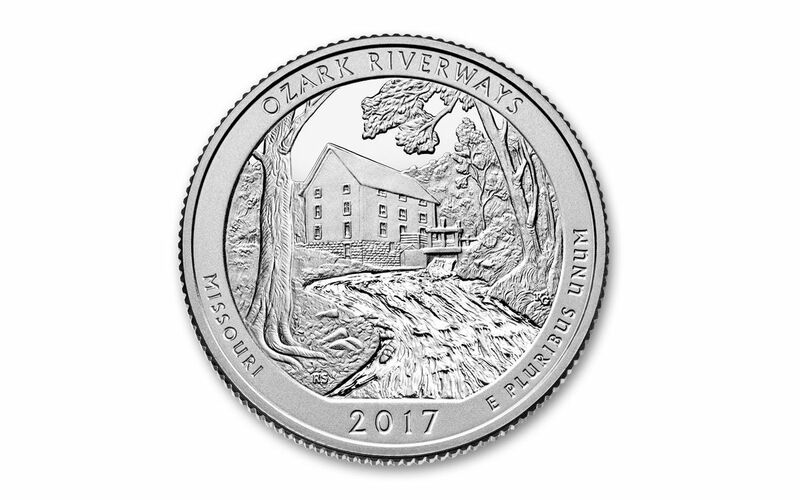 However, looking at the evocative scene of the Alley Mill designed by Ron Sanders and sculpted by Renata Gordon, there's no doubt that the 2017 Ozark National Scenic Riverways Quarter is a winner! Now, you can bring home a special three-quarter set commemorating this special release. All three of these legal-tender 25 cent coins have the same designs in common -- one side features John Flanagan’s restored 1932 portrait of George Washington, while the other side depicts the Alley Mill. 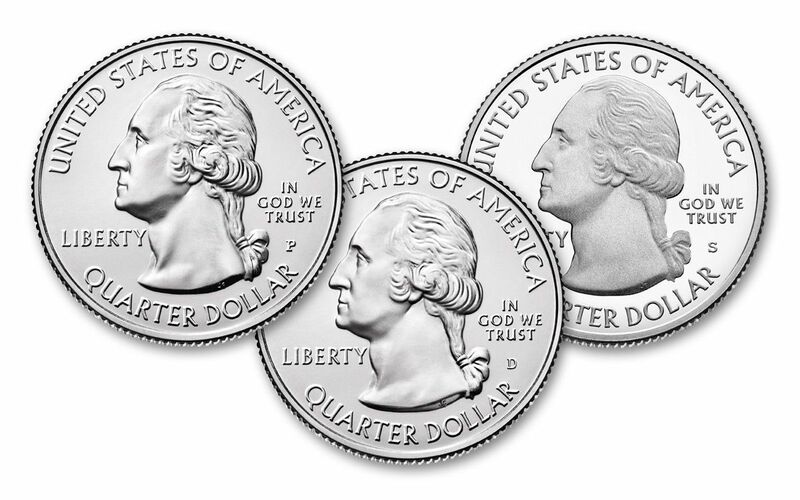 However, each of these quarters hails from a different United States Mint location. 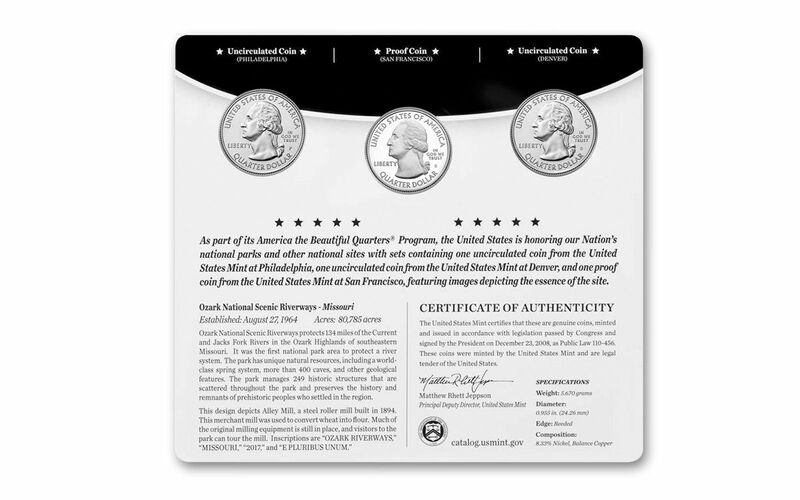 Both the mints at Philadelphia and Denver contribute an uncirculated coin each, while the single proof coin in the set comes from the San Francisco mint-- known for producing exceptionally well-struck proofs with razor-sharp details and mirrored surfaces. 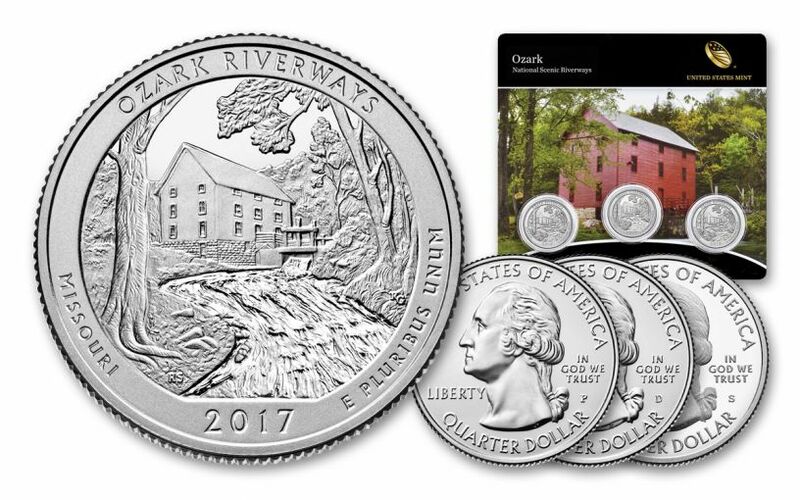 Your 2017 Ozark Riverways Three-Quarter Set will arrive to you in its original United States Mint packaging. All three coins are sealed together in a plastic card, giving you uninhibited visual access to the amazing detail of each quarter. In addition, your display card features a vivid color image of the Alley Mill, information about the Ozark Riverways and a certificate of authenticity. It all adds up to a set that you can't miss. Add one to your cart now before they float away for good!